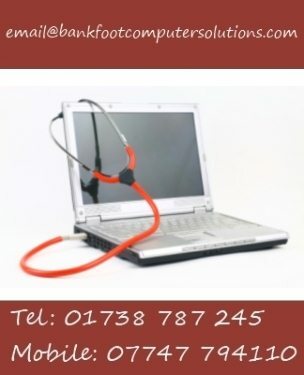 As a local computer maintenance business based in the village of Bankfoot in Perthshire, we offer competitively priced, high quality computer repairs and support to the Perth area. We take the stress out of I.T. by providing a friendly, reliable, affordable and professional computer repair service to business and domestic users in and around the Perth area. Run by a fully trained, highly skilled, computing science graduate with over eleven years of industry experience in IT desktop support and networking, you can rest assured that your computer problems are in good hands. The owner also holds an Enhanced Disclosure Scotland certificate and has full Public Liability Insurance (PLI). We are experienced in all versions of Microsoft Windows as well as hundreds of other software titles. Confident in our abilities to repair your computer, we operate a “No Fix, No Fee” policy. So if we cannot repair your computer on-site or at our premises there is no charge. Unlike many of our high street competitors, our reputation is very important to us, that is why we only give you honest and genuine advice. Whilst we endeavor to repair all computers and laptops, if we believe that it would be cheaper for you to replace your computer rather than go ahead with costly repairs, we will tell you exactly that with no charge. 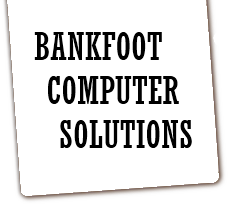 So if you are in the Perth area why not contact Bankfoot Computer Solutions today? The sooner you give us a call the sooner we can repair your computer and get you back up and running again.